OWINGS MILLS, Md. – Baltimore Ravens quarterback Joe Flacco is normally about as emotional as one of the bricks used on the brownstones that line the city's waterfront. So when he was asked about the additional pressure he faces following the team's firing of offensive coordinator Cam Cameron on Monday, Flacco didn't seem overly concerned. 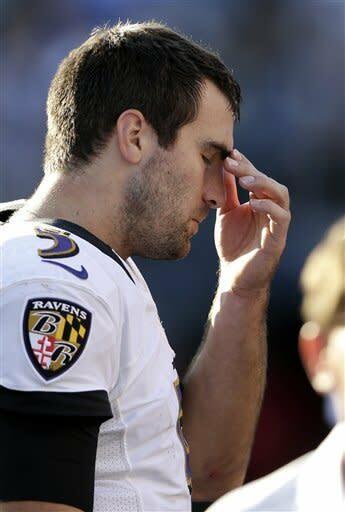 "You face a lot of challenging situations in the NFL and this is the one we have to face right now," Flacco said. Well, at least the deadpan Flacco has a gift for understatement. To put this in perspective, consider: Flacco, the centerpiece of Baltimore's decision to fire Cameron, is also the focal point of a potential Super Bowl run. Additionally, he is scheduled to become a free agent this offseason as the Ravens figure out what he's worth on a contract extension. Or if he's even worth a contract extension. 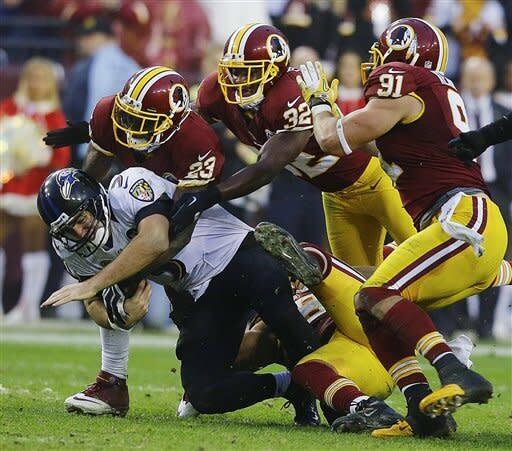 Flacco and the 9-4 Ravens, who have gone from the AFC's No. 2 seed to No. 4 after two straight losses, are in the midst of rare ugliness. Perhaps the most comparable situation to a playoff-bound team firing a coordinator this late in the season is the turmoil between New England Patriots coach Chuck Fairbanks and owner Billy Sullivan in 1978. The Patriots, who finished 11-5 with the No. 2 seed in the AFC that season, ended up getting routed at home in the first round of the playoffs by Houston after Fairbanks previously announced that he was taking a similar post at the University of Colorado. The last weeks of the season were essentially chaos, with players openly wondering who was in charge and whether Fairbanks even cared about what was going on. From a distance, the Ravens appear to have somewhat similar issues, even with strong-willed, bright and energetic coach John Harbaugh running the show. In addition to the coordinator switch, the head coach had to quell a near "mutiny" earlier this season. Harbaugh, a man who comes from a family full of coaches, recoiled at the notion that his team is dancing on the edge of chaos following this latest move. "That's ridiculous," Harbaugh said in front of a group of reporters. After he broke away from the group, he approached the reporter who asked the question and said, "I can't believe you asked that." Well, there are plenty of people who can't believe Harbaugh fired Cameron in the middle of a playoff run. If there is a method to Harbaugh's madness, though, it was summarized by running back Ray Rice, who suggested that Cameron's firing reinforced the club's objective. "It reminds you that we're here to win a Super Bowl and to win it now," Rice said. "Whatever we have to do, we need to win. We've been to the playoffs. We've won a lot of games here. We have to get to the big dance." If the Ravens are going to salvage this season and get there, much of the responsibility will rest on the 6-foot-7 Flacco's right shoulder. He not only needs to eliminate mistakes (he has an interception and lost fumble in each of the past two games), he needs to raise the level of his play. Like closer to the level of the Denver Broncos' Peyton Manning, who he faces Sunday. "This team has done a really good job in the past of just playing football when we have dealt with tough situations," said Flacco, who admitted several times that an offense that now features him, Rice, Torrey Smith and Anquan Boldin has underachieved. "We wouldn't be in this situation if everything was going the way we all expected," said Flacco, who could be in line to make upwards of $18 million per year on his next contract (the going rate for top-tier quarterbacks). That's a pricey figure considering his quarterback rating of 87.1 and 18 TD passes to nine interceptions are borderline mediocre. Therein exists the perceived problem with Cameron. Over the years, Flacco has never taken the next big step in his evolution as a quarterback. Late last season, as Flacco helped the Ravens get to the AFC championship game, he appeared to take another step, but he hasn't followed through this year. At a time when Baltimore's offense needed to be better than ever to overcome injuries to defensive players Terrell Suggs, Lardarius Webb and Ray Lewis, the offense has been in neutral. The Ravens have scored 30-plus points just twice in the past seven games. In addition, the running game hasn't done enough to control games and keep the defense off the field. "It's always disappointing to not be able to do things you feel you're capable of doing," he said. "There have been games where we don't necessarily need to take a lot of chances and times where we lean on our defense." But not only does Flacco have to now deal with that pressure, he has to deal with a whole line of problems that come up anytime you change a coordinator. This is not just about the different philosophy of new offensive coordinator Jim Caldwell; it's about simple things, such as how plays get called and how quickly they get relayed from the coaches' booth to the field. Harbaugh said he wasn't sure exactly how that was going to go yet. He also said that there was no time to run mock games, where the coaches get together and go through an entire game's worth of play calls. In real life, however, here's what needs to happen: The play call, whatever it is, needs to get to the huddle in enough time that the Ravens can get to the line with at least 15 seconds left. "If you want to change anything at the line of scrimmage, that's how it has to work," tight end Ed Dickson explained. "You can get to the line after that, but you're not shifting or adjusting. You're just running the play … we're pretty good at that, which is why you don't see us get a lot of delay-of-game calls or use up a lot of timeouts." Or, in coaching parlance, the offense loses the last chance to hold a piece of chalk. And that means that Flacco loses yet another advantage. • Are the flailing Lakers beyond repair?